Valentine’s Day can be stressful. The bar is set pretty high, romance-wise. 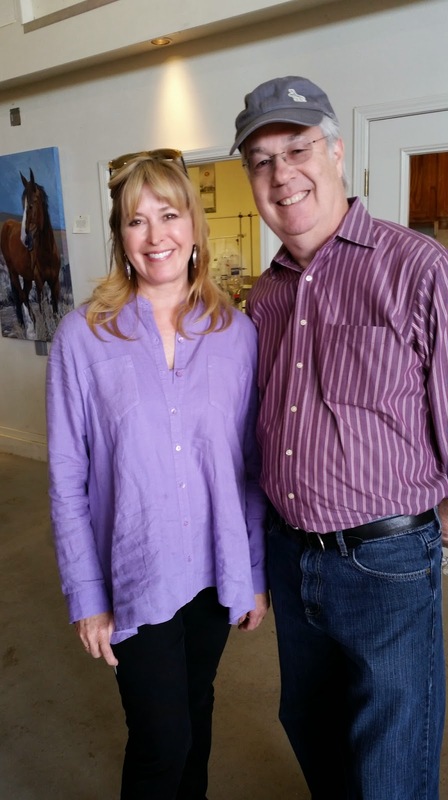 Luckily we had a pretty iron-clad plan for the entire Valentine’s weekend: wine tasting in Lodi and a lovely dinner on Saturday followed by a Darcie Kent wine club release party on Sunday. What a way to avoid the stress of Valentine’s Day and focus on the fun! 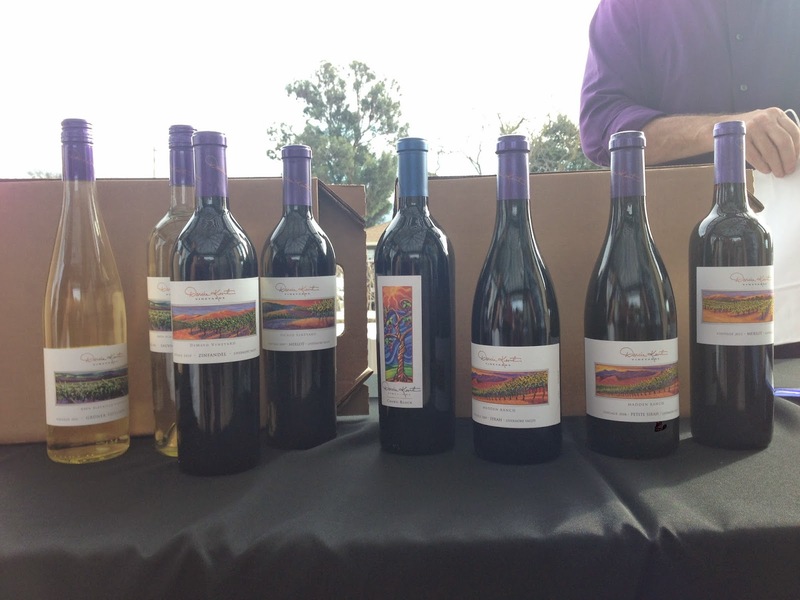 With a full day of wine tasting the preceding day, it was time to attend the release party. Yes, wine tasting is not a hobby for the weak! Luckily, we have spent years preparing for this weekend. As expected, the parking areas were packed with cars. What did surprise us was the lack of people milling about. Where did they all go? Could this be a Soylent Green event (you may be too young, Google it)? With a bit of trepidation, we advanced to the check-in table. As usual, we were warmly greeted by several Darcie Kent employees, who have an encyclopedic memory for their members’ faces. So far, so good, no food factory yet…. At last, the mystery was solved! The area with picnic tables had been the main space for previous release parties. That area was still in use, but a new, much larger space behind the barn was now the feature area. Boom! A much larger space with better shielding from the breeze and easy access to the barn interior. That’s where everyone was hanging out! The new party space really let everyone spread out. A string duet in one corner played a fun rock/pop mix on cello and violin. Yes, that’s right, on a cello and a violin. Different, yes. Fun, definitely. Kerry Borgen and Gretchen Egen are Musical Heart Strings. Their take on The Who, the Rolling Stones and other (can’t bring myself to use the “classic” term) rockers was a real treat. Playing for an audience engrossed in wine tasting is not an easy gig, but Kerry and Gretchen got heartfelt applause after every song. Well played! 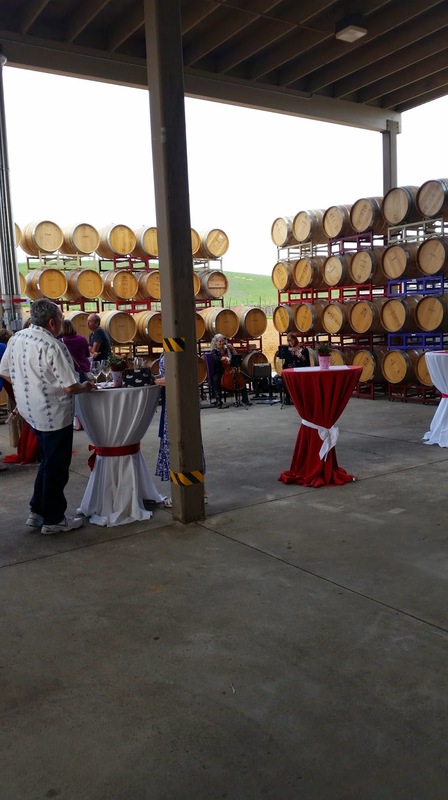 The party followed the pattern of previous releases: tasting stations that each featured a new wine paired with a lovely hors d’oeuvre. The larger space allowed the stations to be spread out better, eliminating the crowds that dampened previous events. This time there was plenty of space, some great vistas of the green hillsides, stacks of barrels to build anticipation about future releases, and even a view of Darcie’s painting corner. Yes, Darcie challenged herself to attempt some painting while entertaining literally hundreds of club members. 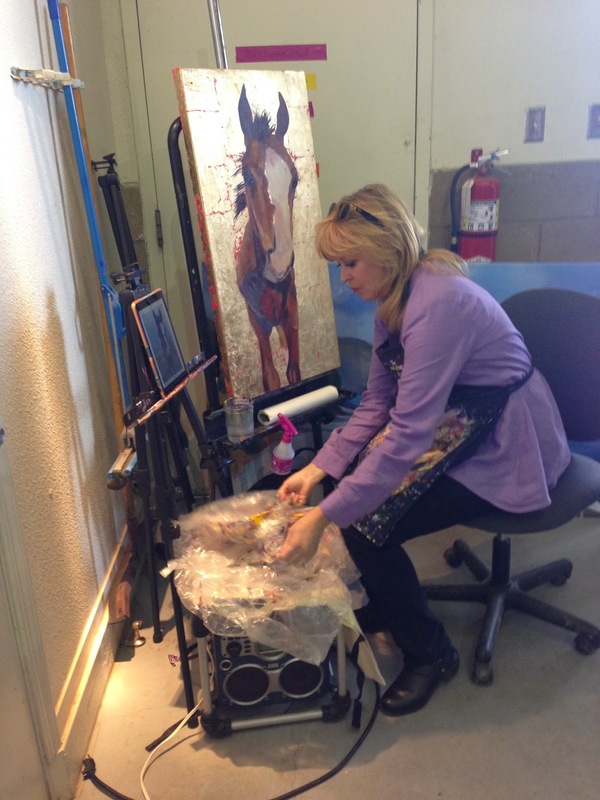 It was fun seeing her approach to painting, but I’m not at all sure how much actual painting got done. 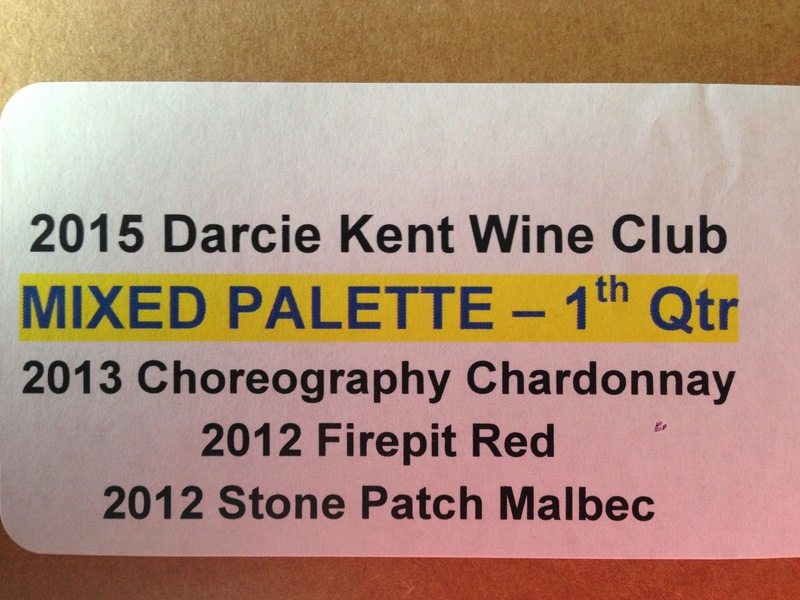 We tasted a new blend: their 2013 Choreography. A blend? Yes, but possibly not what you think. This is a blend of two different Chardonnay vineyards. Most (85%) of the grapes are from Santa Cruz, a very tony vineyard high up the mountain. 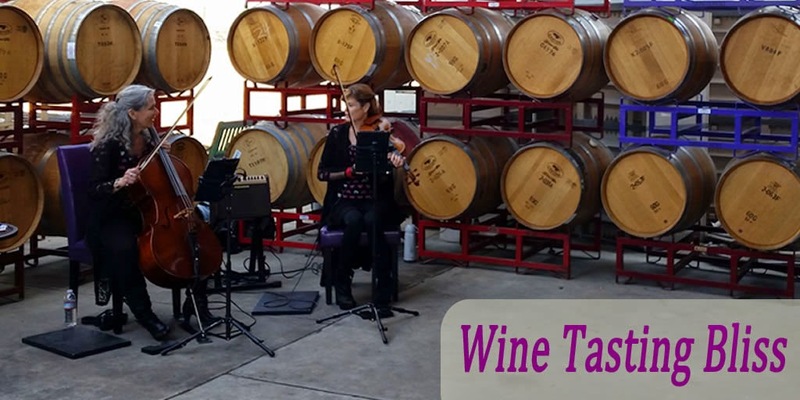 The one acre vineyard is hand-tended, and possibly serenaded by minstrels at night. OK, I made up the part about the minstrels, but the grapes were VERY pampered. 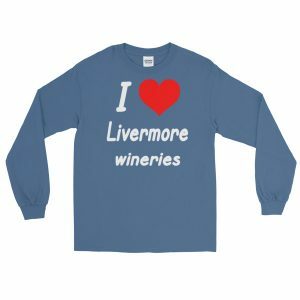 The balance of the grapes are from the Hoffman vineyard in Livermore. 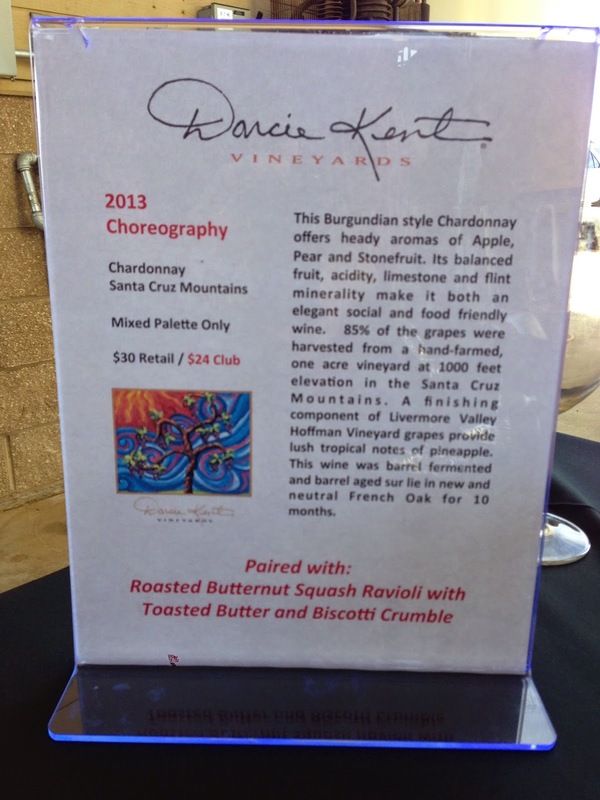 We found the Choreography to be bright, crisp and refreshing, which paired beautifully with the roasted butternut squash ravioli with toasted butter and a biscotti crumble. The DK tasting notes mentioned notes of pineapple, and we certainly agreed! This was in our Club pack, which made us very happy. Zinfandel, and 4% Petite Sirah. Whew, what an ingredient list. The good news is that it is delicious! It was paired with Gruyere cheese cubes drizzled with plum and cherry relish. This was a favorite bite with our table! I won’t lie, we went back to this tasting table more than once for more cheese and relish. 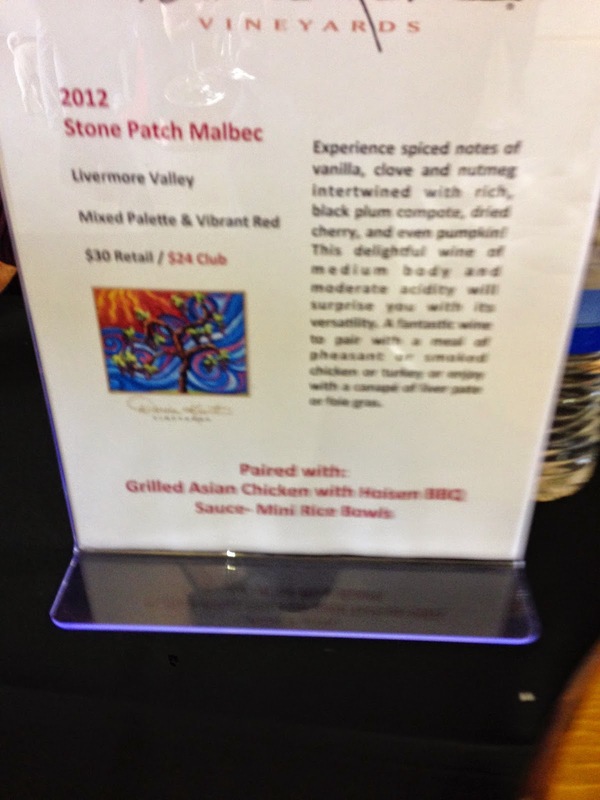 Next up for us was their 2012 Stone Patch Malbec. It was paired beautifully with grilled Asian chicken in BBQ sauce over rice. A nice balance of spice and stone fruit, the Malbec stood up well against the aggressive flavors in the chicken to create a wonderful melody in the mouth. An interesting juxtaposition as the string duet played themes from Star Wars in the background. This wine, too, was destined for our Club pack, yippee! 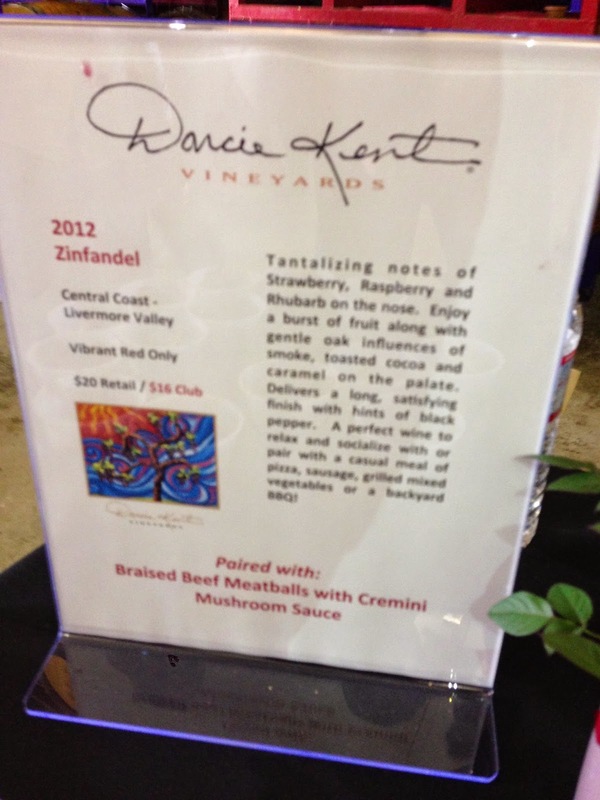 Our next tasting was an amazing 2012 Zinfandel, paired with braised beef meatballs with a cremini mushroom sauce. This triggered several conversations. First, given our previous day’s experience in Lodi (self-proclaimed capital of the Zin world), how did Darcie’s Zin compare with the Lodi Zins? We debated and put this among our favorites. Nice spice, but not too explosive. Sorry, Lodi, but this is a contender! Second discussion: would it be too obvious to IMMEDIATELY return to the tasting table for another bit of the meatballs? We solved this the old-fashioned way and sent the other pair from our group. No awkward situation resulted. Another reason to always wine taste in groups. Our final tasting was a fantastic Alviso Port! Yes, Port has come to Darcie Kent. Before Darcie Kent owned this property, Cedar Mountain Winery was here. 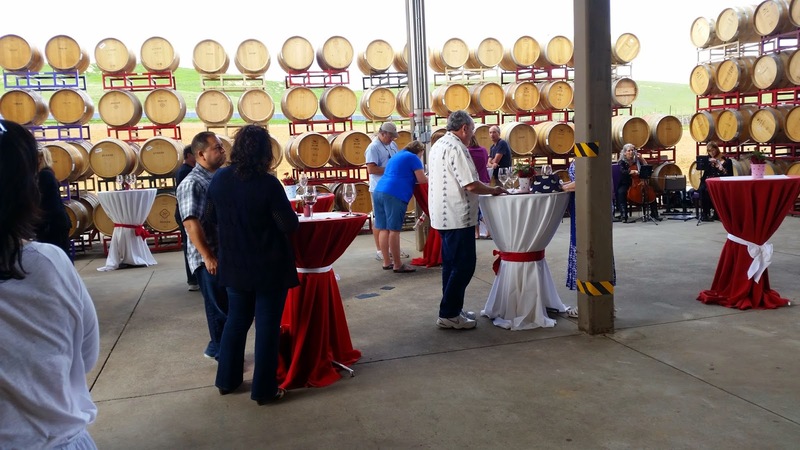 Cedar Mountain produced wonderful wines, but their legend was built on their ports. This Alviso Port continues that tradition; not to jammy but not a wimp by any means! 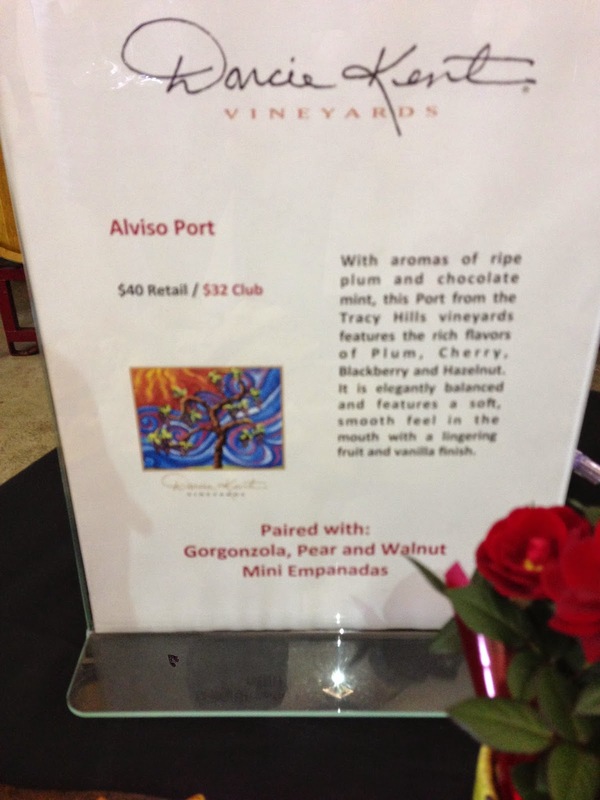 The port was paired with Gorgonzola, pear and walnut empanadas. Another great pairing, but it was the port that brought us back. It is so exciting to have the tradition of Port maintained by Darcie Kent. An interesting side benefit of using the barn for wine tasting was the opportunity to check out the automated bottling line. Admittedly, this was a lot more interesting for the engineer in the group, but everyone else pretended to interested, too. 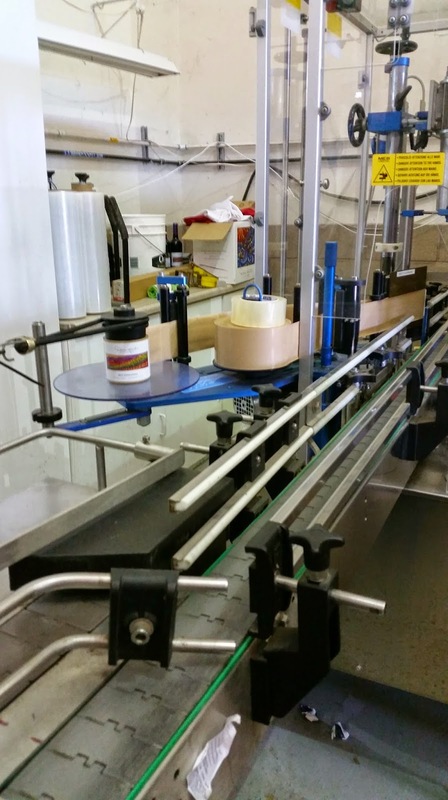 In the space of a few dozen feet was everything needed to transform a barrel of wine into corked bottles, complete with foil tops and front and back labels. The only was to improve this gawking opportunity would be to fire up the line and watch the robots do their thing. Maybe next time, Darcie? Once we satisfied ourselves that we had fully experienced all of the pairings, we prepared to leave. 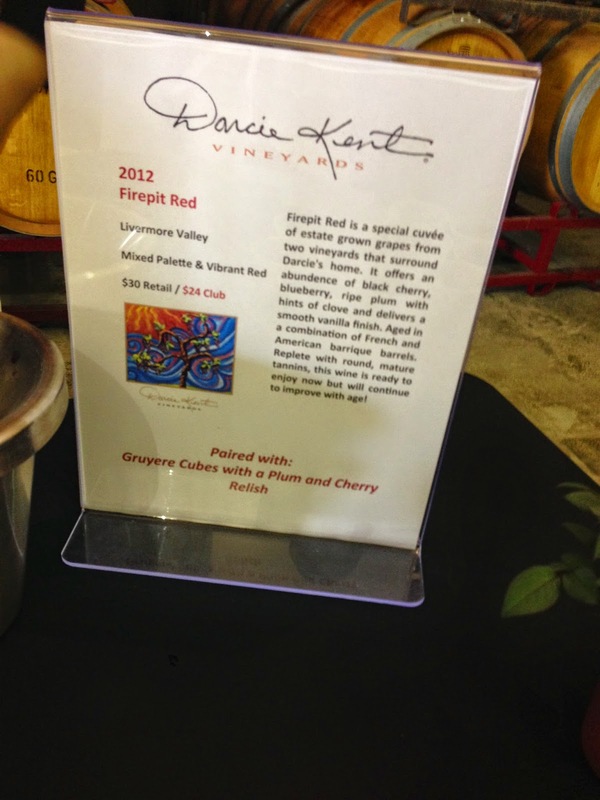 First, though, we introduced ourselves to the chef who was responsible for all of the wonderful pairings. We met Dylan Arriaza, chef and sommelier with VinX. Working in very humble surroundings, Dylan was able to deliver great flavors that highlighted each wine perfectly. Graciously, he gave each of us one last sample of his meatballs before we had to say goodbye. Our final task was queuing up for our Club pack. It turns out that standing in line is very acceptable if you have a nice glass of wine in your hand! In no time at all we found ourselves at the checkout table. 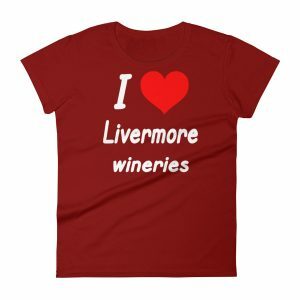 We reluctantly passed on the special prices offered on a number of previous favorites (that wine storage issue just isn’t getting better at home) and limited ourselves to accepting our Club pack. It is hard to feel sorry for ourselves, though, walking away with a box containing a bottle of Choreography, a Firepit Red and a Malbec. Can’t wait to find out how these new wines taste at home. 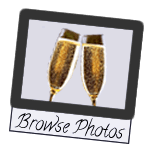 Have you visited Darcie Kent? Click to give'em a tweet of support!